This Lent, I’ve been doing a reading plan through Bible Gateway that will take me through all of the New Testament by Easter. So far I’ve been quite good about it—there have been a couple days when I missed all or some of the chapters, but I’ve always gone back and caught up. I’m over halfway through the plan now, and yet, I don’t really feel like it’s doing anything. Sure, sometimes when I read it I’m not fully engaged and am reading the words merely to say I’ve read them, but there are times when I really am paying close attention. In an effort to keep me from being able to skim so easily, I’m reading The Message, instead of my usual NIV or ESV. There have been moments when certain verses or phrases stick out to me a bit, but certainly no lightning bolts. Not that I necessarily expected one, but it sure would be nice. I’ve tried not reading the Bible at all for a while, I’ve tried eating something I enjoy while I read it as a reminder of its goodness, and now I’m trying a fairly regimented approach to reading it. And none of it seems to be “working.” Whatever “working” exactly means when it’s applied to Bible reading. If it’s supposed to break God’s seeming silence, it’s certainly not working the way I’d like it to. I can’t pinpoint when I wandered into this weird space of not really knowing what’s going on with God. It’s been some time now though, and while I’ve seen glimpses of him here and there, mostly I have not. God is there—I’m as certain of it as I think I can be (which is to say, not 100%, but enough to continue believing and living like it)—but it kind of seems like he’s not. In the midst of all of it, I’m continuing to look for the lessons here. And I’m coming to realize it’s not in my right to DEMAND more of God. It’s what I want to do, and oh how I wish he’d give in to my foot-stomping wails for him to appear, but that is not how he operates. Or at least, it’s not how he has to. He doesn’t have to do anything. 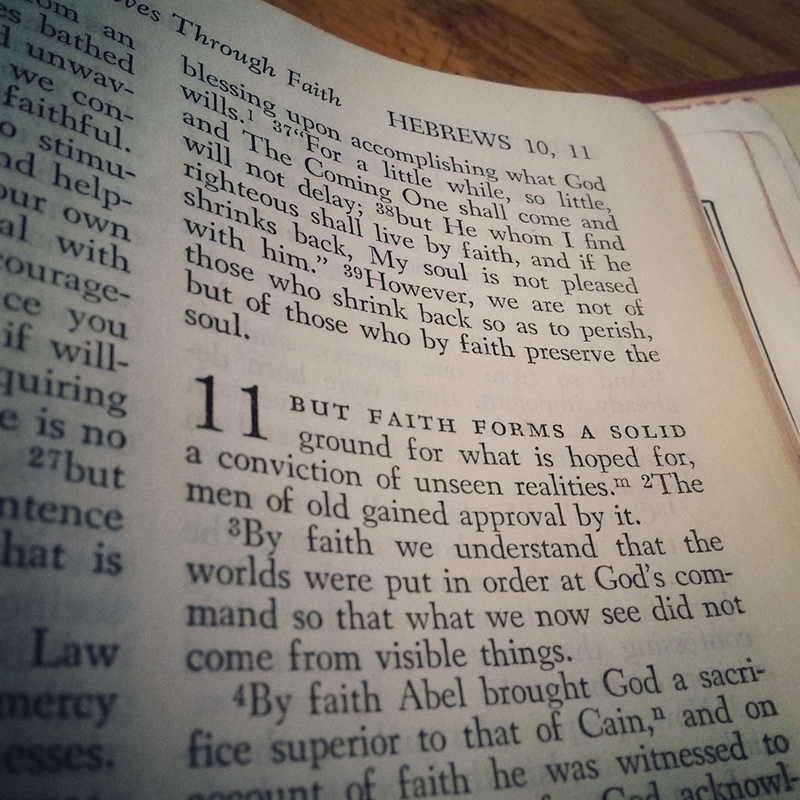 I’ve realized I’m still not tempted to walk away from this faith thing—that’s never really been a serious consideration in my mind, even here, in this strange space. I think this is me learning that inherent in the idea of “faith” is the idea keeping after it, whether or not the feelings are there. If the ways I’ve seen and felt God at work in my life turn out to be all I ever get, for the rest of my breathing days, is it enough? I can’t say with absolutely certainty, because life may be long and messy and painful, but I think it might be. If reading the Bible never starts feeling like it’s “working” again, if my problems with prayer persist, if God never shows up in a pillar of fire, is it enough? Oh, God, where are you now? It feels almost wrong for me to be the one asking that question. On the list of true tragedies, I’ve suffered none of the big ones. Yet, not being able to see you kind of feels like one, in a way. So I’m writing, because good relationships have good communication, and it’s probably past time for me to tell you how I feel. This silence has gone on for long enough, don’t you think? I thought maybe you’d show up on the mission trip; I saw a flicker of you, but not a flame. Maybe it was my own skepticism getting in the way. It’s not that I don’t believe in you or that I don’t think you’re entitled to do what you want (you are God, after all), but everything feels rather messy. God, there’s so much Broken here. The fighting and the uncertainty and the illnesses and the doubting and the death. There’s an ache here, in the world, but also in me. They tell me you cry when we cry, that you’re near to the brokenhearted, and I believe that about you—it’s one of the things bringing me back, time and time again—but it really doesn’t always feel that way. Because even though I know the textbook answers of why you don’t always step in to fix the Broken, they don’t always make sense in the here, the now, in the dust and the ugly. It’s not just the big questions that bother me, either. For one so big, you have mastered the silence. I know this is part of faith, the times where you are so near it is breathtaking and the times when you so distant it is maddening. I am not the first, or the last, to experience and to question this. To question you. And I am questioning you. Not whether you exist, because I am quite certain, even in the silence, you hold me so tightly and tenderly that I can’t ever truly walk away. But I do question your ways. I don’t think you’ll strike me down for writing this; nor do I think that, because I’m being honest, putting this all out there, airing my grievances, you will “reward” me by showing up in some way I’ve been hoping you would for quite some time. You are no genie, waiting to be summoned from a lamp. Because if you were, you would have showed up by now. I’ve tried everything but rubbing lamps to get you to appear. It frustrates me that you show up so readily for other people, who seem to know you and feel your leading in ways I just don’t. Maybe it’s a faith thing, and I don’t have enough, or maybe it’s because we’re different people and simply bound to experience you in different ways, but I can’t help but wonder why you can’t give me a dose of what they get. You’re kind of a shifty fellow who’s hard to figure out, because you don’t work the way I want you to work. And maybe that is what the silence is about—teaching me that you work here, in the silence, as well as in the noise. You might be standing right off the edge of the stage, waiting, quietly, patiently, to make your appearance, because the time hasn’t come yet. But I’m hoping it’ll come soon. p.s. What do you do when God seems silent? There are a lot of things you’re not directly taught as you’re growing up. And now, this. How to mourn. Recently a guidance counselor at my former high school passed away after having had cancer for many years. I knew her from when I was in school, having been in a group of peer listeners that she trained and oversaw. After high school, I had the privilege of babysitting her daughter a handful of times. I can’t say I knew her overly well, but what I did know was wonderful. She was kind and welcoming, funny and smart. When I went to their house to babysit, I could almost tangibly feel the love it was saturated in. This was not just a structure to keep them safe from the elements; she and her husband and their daughter enjoyed a home there. I am blessed in that no one I am incredibly close to has passed away in my lifetime, though I know at some point that will change. My own experience is not adequate to help me imagine the depths of pain her family and close friends are going through. And there are others like me, who knew her somewhat, who experience a sense of loss as well. And truthfully, I don’t know what to do with it. This is not the first time someone I know has passed away, and every time, I don’t quite know what to do. She is certainly a woman worth mourning. But as someone who didn’t know her all that well, wasn’t even in regular contact with her, how do I do that? How do we mourn anyone we didn’t really know all that well? What does mourning look like from the sidelines? Today I am much more full of questions than of answers. I leave you with these words her obituary. They are beautiful, and fitting for many. There were no platitudes or schmaltz in her faith, just the recognition that much of life is sheer mystery and so is God—but He can be trusted. She knew his love for her through Christ and found as well serendipitous expressions of His grace in the world and people around her. “Don’t ever say that I lost my battle with cancer,” Tasha once said. And she didn’t. The gospel is true. The cancer is dead. Natasha lives. And we will see her again. p.s. Any thoughts? How do you mourn someone you don’t know all that well? Also, you can read some of her story on her blog. There have been many shootings in the United States in my lifetime. Some I was too young to hear about besides in passing. Others have taken place more recently. I hear about them and feel sorrow for the state of the world and my country, that such things have become nearly commonplace. But this. This is horror on a different level. Children told to cover their eyes as they walk from their own school. Parents weeping, going home to see Christmas gifts that will never be given. I have 2 nieces and a nephew, all under the age of 4; for now, and likely for quite some time, my attachment to them is the closest thing I have to being a parent, and it is hardly a comparison at all. Though my love for my nieces and nephew is nowhere near that of a parent for a child, it gives me a new perspective on the horror these parents and families must now live with. A heavy heart and few words are all I have. Words often help me begin to understand, to see things differently; but pages and pages of words would only lead me to “Whys?” And that is a question that will never be fully explained in this lifetime. I know that God is good, God is sovereign, God is loving; these things provide hope, but not all the answers we seek.